Just as the tomatoes and peppers are timidly stretching their rootlets into the (finally!) warming soil of the main vegetable garden, we’re filling baskets with produce from the raised beds. Every mealtime provokes a variant of the same question: What shall we do with all the cauliflower/peas/artichokes /scallions/turnips? On a warm day, my choice is often an aioli platter. Aioli is the finest way to celebrate the garlic harvest, which also happens about this time. At the moment, our garlic stalks are just starting to bend; we’ll probably harvest in a day or two. Fortunately, the garlic we grow keeps well for more than a year, so last week I twisted a bulb from one of the last of 2010’s braids hanging from the kitchen wall and started mashing a few cloves for aioli. Aioli is the Provençal word for an emulsion of olive oil, egg yolk, salt, and garlic. Common also in Catalonia and elsewhere in eastern Spain, where it’s known as allioli, this sauce is almost certainly the original mayonnaise (whose name comes from Mahón, Menorca). 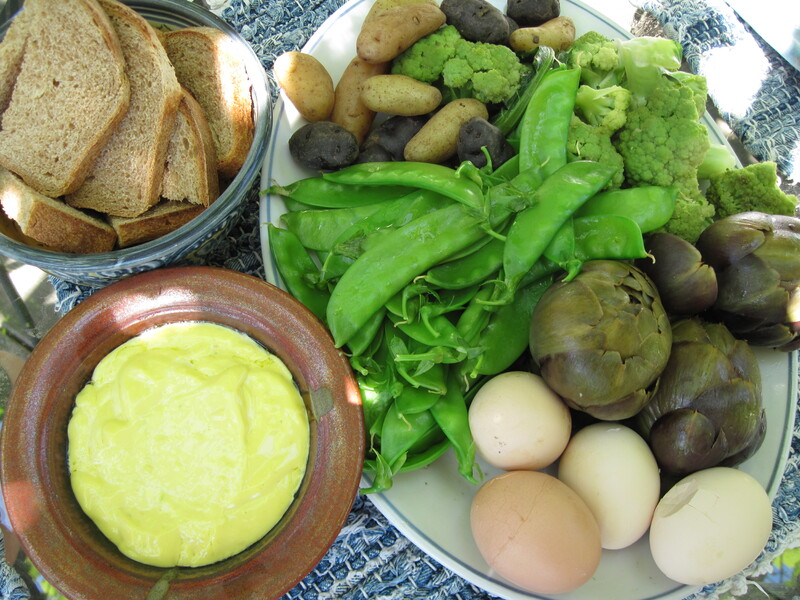 Aioli goes well with many foods, but we usually have it with boiled or steamed vegetables and hard-boiled eggs. To make aioli, you must mash the garlic thoroughly; fresh garlic is preferred for its ease of mashing as well as for its flavor. I smack three or four cloves with the side of a chef’s knife, peel the cloves, and then either smack them again and mince them or else pound them in a mortar. I combine the garlic with about 1/4 teaspoon salt and an egg yolk—or, if I’m feeling lazy, a whole egg. Then I get out the olive oil. I use extra-virgin, but not the best; I prefer the flavor of aioli made with fairly bland oil. Or, for a very different and even more delicious taste, I substitute roasted hazelnut oil. I have often sat on the floor with a small bowl between my bare feet and beaten in the oil with a whisk, drop by drop, but if I start with a whole egg or two yolks I can use a hand blender, running it on high speed while pouring in the oil, about 1 cup. I stop blending when the aioli is very thick. This happens in less than a minute with the hand blender, and perhaps 10 minutes with a whisk. If I beat in a little prepared mustard and lemon juice, I have mayonnaise. But usually I prefer plain aioli. I chill the aioli while cooking the vegetables and eggs. Last week I steamed artichokes, cauliflower, potatoes, and snow peas. The artichokes went in one pan, with about an inch of water, for an hour. I put the cauliflower, broken into florets, on top of the artichokes for the last 10 minutes of cooking. In another saucepan, I simmered small new potatoes, with salt and about 1/2 inch water, for 20 minutes; I added snow peas on top of the potatoes for the last 4 minutes. I boiled eggs in a third saucepan, this way: I covered the eggs with cold water, put the lid on the pan, brought the water to a boil, and then turned off the heat. The eggs were ready in 15 minutes. I rinsed them in cold running water. Usually I’d peel them in the kitchen, but on this lazy day we did the peeling at the table. I don’t chill the cooked vegetables or boiled eggs for aioli. They are best when still slightly warm. The last, nearly essential ingredient of an aioli platter is bread. It can be brown or white, toasted or not. For me, aioli and good bread alone can make a satisfying meal. Last week’s aioli platter was a fine one, but my mouth is watering now for the one that’s coming soon, just after we pull his year’s fresh, juicy garlic from its bed. This entry was posted in Vegetables and tagged aioli, food, garlic, mayonnaise, vegetables. Bookmark the permalink. Do I see baby potatoes on your platter too? Just harvested the first cauliflower I’ve ever grown (with a big grin). The first thing that comes to mind for me is pickling it. I was recently at the San Francisco Ferry Building’s farmer’s market where a latino food vendor serves house made pickled veggies with all dishes and inside his tamales. Taste amazing. 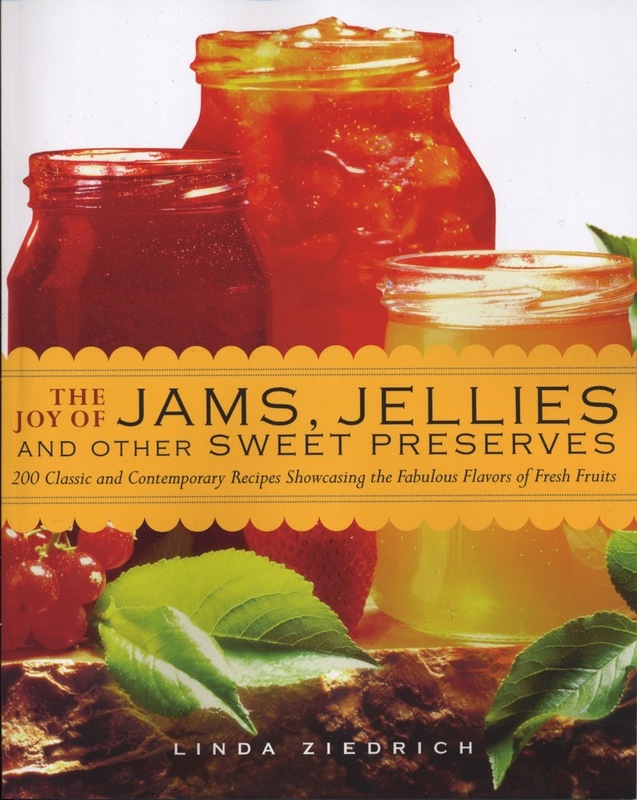 I know the book I’ll reach for being a beginning pickler! You see potatoes, Lynn, though they came from the store. I did harvest a few similar ones today, though–from the garlic bed, which was a potato bed last year. 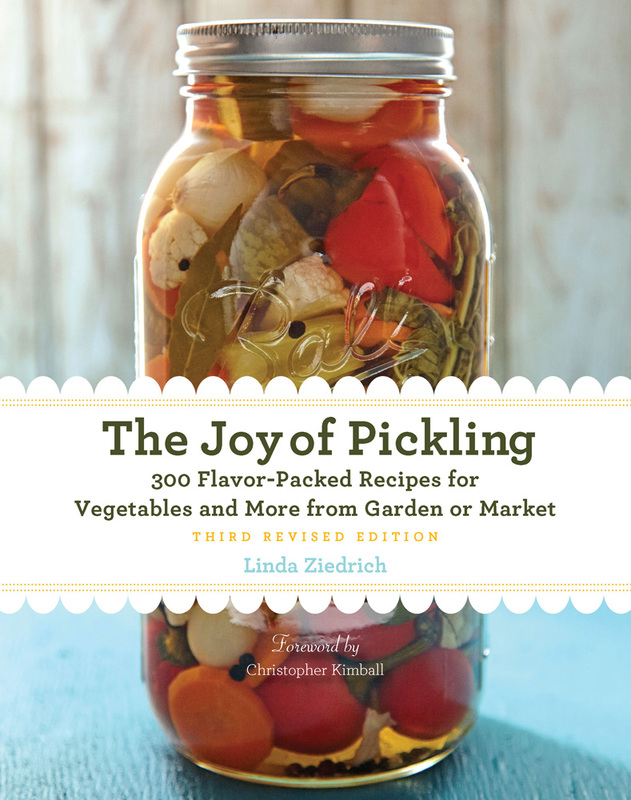 Have fun pickling your cauliflower! Yum – this looks great. Can’t wait to try it. I always think of raw veggies and dip but this will be a great variant. Still waiting for my peas to arrive here in Michigan. In a stroke of brilliance the other day, my daughter made aioli with sunflower oil. I don’t mean refined sunflower oil, but the powerful-tasting stuff that you buy at Russian markets. Unrefined sunflower oil is generally too strong for my taste, but in aioli the sunflower flavor is well balanced by the garlic and egg. Rebecca used the aioli to dress red cabbage for cole slaw, and yesterday I glopped the leftover sauce on bread, tomatoes, and feta cheese. Give sunflower aioli a try!